The image shows suicide bomber Ayyat Al-Akhras, who murdered 2, holding a handgun. 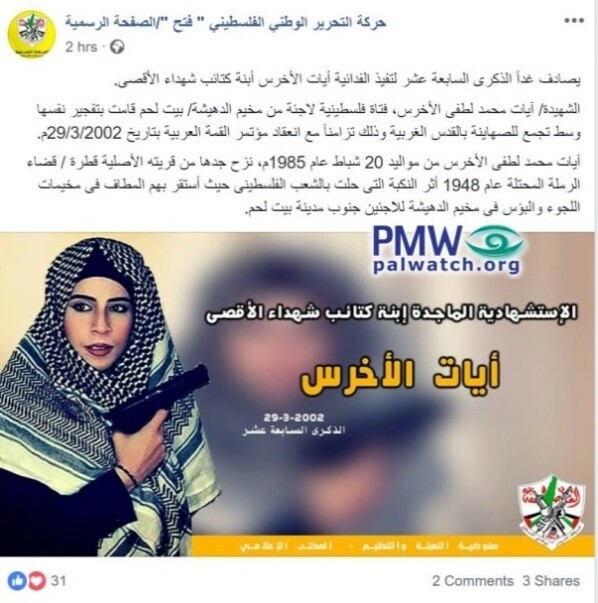 In the bottom right corner is the Fatah logo that includes a grenade, crossed rifles, and the PA map of “Palestine” that presents all of Israel as “Palestine” together with the PA areas. The post was removed the same day it was uploaded, and later the same day the same exact text was uploaded again on the official Fatah Facebook page without the image of suicide bomber Ayyat Al-Akhras. Ayyat Al-Akhras - The youngest female Palestinian suicide bomber (aged 17). A member of Fatah, Al-Akhras carried out a suicide bombing attack near a Jerusalem supermarket on March 29, 2002, murdering 2 and wounding 28.